It's back to school for many children today. I remember those mixed feelings of sadness, excitement and anticipation of the first day of school. It was always good to see my friends again, but I was not excited about doing math or biology. Now that I no longer a student in that brick and mortar building, my schooling happens everyday out in the world. I learn something new all the time. One of my teachers in life and music is the extremely talented Keola Beamer. He has taught me the true meaning of Aloha. He is an excellent teacher. Very patient, gentle and kind. Some people call him "Mr. Nahenahe" . Nahenahe ……is one of the most beautiful words in the Hawaiian language… one definition of the word in the Pukui and Elbert dictionary is “soft….a gentle voice”. 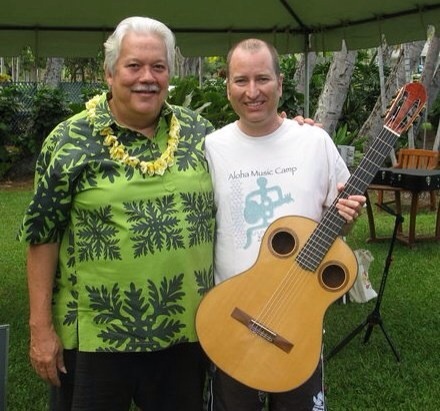 Not only is his slack key guitar playing nahenahe, but also his personality. Whenever I am in a tight situation I think of him and immediately try and become more nahenahe. It's easy to do when you mix in an abundance of aloha. Tonight let's celebrate learning and inspiration with some good old nahenahe ukulele playing here at my shack. My kumu "Mr. Nahenahe" Keloa Beamer. Mahalo for teaching me the true meaning of Aloha!